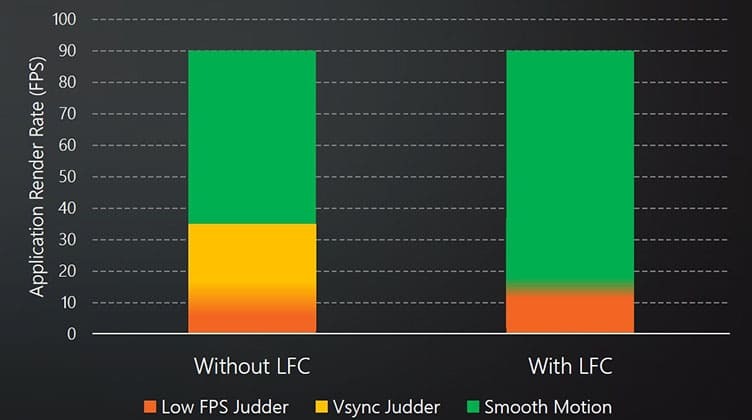 AMD FreeSync synchronizes a compatible monitor’s refresh rate (Hz) with a compatible graphics card’s frame rate (FPS). As a result, all screen tearing and stuttering is eliminated within the dynamic refresh rate range of the display. 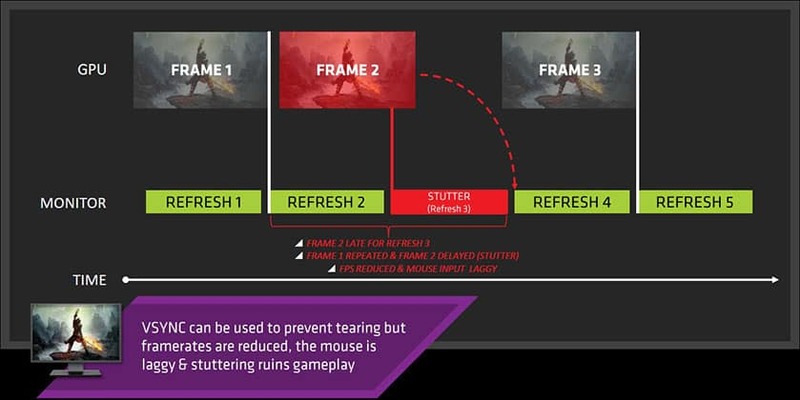 AMD Radeon FreeSync technology uses the Adaptive-Sync protocols of DisplayPort and HDMI connectors to provide a variable refresh rate (VRR) which allows refresh rates of a monitor to change dynamically and in synchronization with frame rates of a graphics card. AMD has worked with VESA (Video Electronics Standard Association) to add support for Adaptive Sync into the DisplayPort 1.2a standard, and later HDMI, which they then utilized for their FreeSync technology. 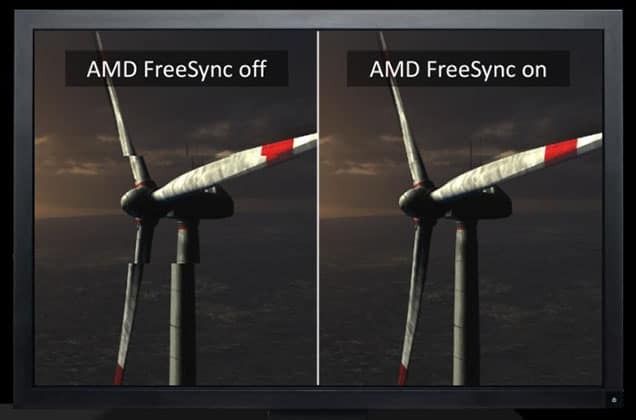 With AMD FreeSync, you will not get screen tearing or visual latency which you typically get from having VSYNC disabled. You won’t get the stuttering and input lag associated with VSYNC enabled either. 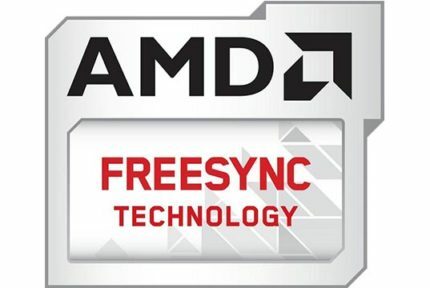 To take advantage of the benefits of AMD FreeSync technology, users will require a FreeSync-compatible monitor and a FreeSync-compatible AMD Radeon GPU. As of 15 January 2019, you can also use NVIDIA graphics cards (GTX 10-series, GTX 16-series, RTX 20-series or newer) with G-SYNC compatible FreeSync monitors. What Does AMD FreeSync Do? In order to understand how FreeSync works and what it does, you need to know how a monitor and a graphics card communicate with each other in order to create an image. In short, the GPU renders the frames and sends them to the display which then refreshes those frames a certain number of times (60 times if it’s a 60Hz monitor, etc) to create the picture. However, sometimes the GPU will send excess frames to the display whilst the monitor is still displaying the previous refresh cycle. This creates screen tearing (picture below). You can get rid of screen tearing by enabling the VSYNC option in your drivers or video game settings. VSYNC forces the GPU to wait until the monitor is ready to display the next frame thus eliminating screen tearing. Consequently, this introduces additional input lag and if the card cannot render the frames before the next refresh occurs, it will be displayed again which creates screen stuttering. In the end, you are choosing between no screen tearing at the cost of input lag (VSYNC on) or screen tearing and lower input lag (VSYNC off). This is where FreeSync kicks in and makes the GPU and the display work in perfect harmony within a certain refresh rate range; the width of that ranges depends on the monitor. As long as you are within the dynamic refresh rate range of FreeSync, you will not experience screen stuttering, tearing, nor extra input lag. If your FPS (Frames Per Second) rate dips below that range though, FreeSync stops working. The main problem here is that many FreeSync monitors have a narrow dynamic refresh rate range; for example 48-75Hz or 40-75Hz instead of 30-75Hz for monitors with a 75Hz maximum refresh rate. 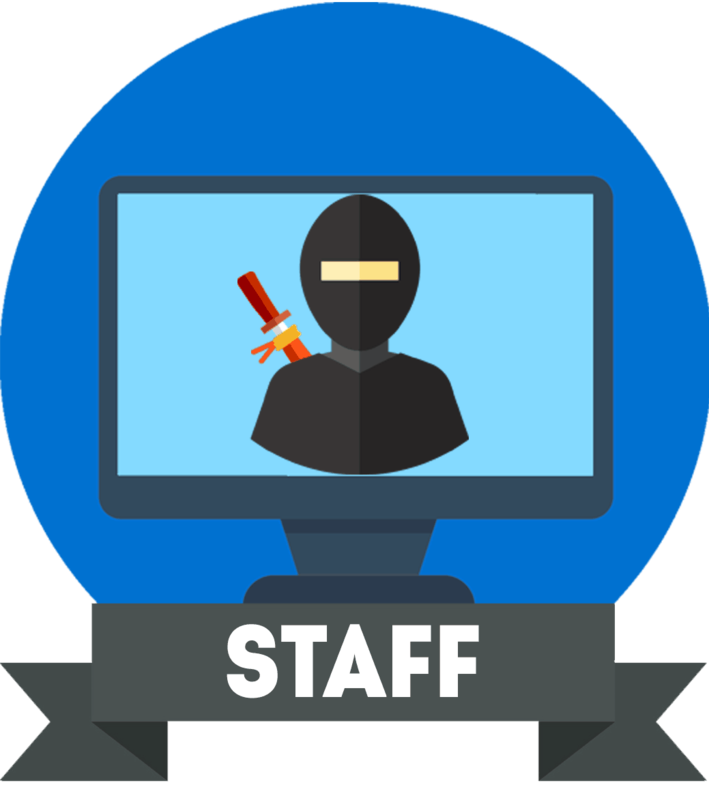 It’s possible to increase the dynamic range on some monitors using the CRU (Custom Resolution Utility) third-party software. Some FreeSync monitors, however, feature the AMD LFC technology which multiplies the refresh rate when your FPS drops below the lower end of the range thus maintaining a smoother judder-free performance. For example, if your FPS rate drops to 22 FPS, LFC will change the display’s refresh rate to 44Hz which results in less screen tearing and stuttering. All monitors that have a variable refresh rate range of at least 2:1 (for instance 50Hz-100Hz) automatically support LFC. So, if you are looking for a FreeSync monitor, you should look for a wide variable refresh rate range and the LFC support. While G-SYNC displays have a dedicated module installed in them which significantly adds to the price of the monitor, AMD FreeSync adds no extra cost to the monitor. However, G-SYNC monitors usually also have a wider dynamic refresh rate range and low input lag. Further, G-SYNC is only supported when the monitor is connected over DisplayPort whereas some FreeSync monitors work over both HDMI and DisplayPort. Lastly, G-SYNC monitors support variable overdrive which allows you to simultaneously use response time overdrive and variable refresh rate whereas FreeSync monitors are usually limited to the default response time speed if you can to use VRR. FreeSync 2 is the second generation of FreeSync technology which brings support for low input lag HDR PC gaming. FreeSync 2 monitors must also support LFC, have double the maximum brightness than standard monitors, and cover more than the standard sRGB color space. Learn more about FreeSync 2 and HDR (High Dynamic Range). Unlike G-SYNC, FreeSync is also available on Xbox (Xbox One, Xbox One S, and Xbox One X) gaming consoles and certain TVs as well. 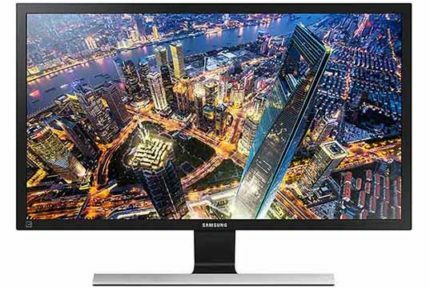 See a list of all FreeSync monitors here.